Arrowhead is known to be the loudest stadium in the world, and it’s about to get even louder with the noise of massive trucks and motor vehicles. Never before has Monster Jam entered into the gates of Arrowhead, but this summer will be history in the making and you won’t want to miss it, get your Monster Jam tickets now! If you know Monster Trucks you know the name Bob Chandler. If you don’t know Monster Trucks, you’re about to. The history of these massive trucks is not very complex but does date back to the late 1900’s. Bob Chandler took his 1974 Ford F-250 pick up and changed it around to be bigger and better. He named it “Big Foot.” He began to take his new “car” down to the junk yard where he would attempt to smash, destroy, and crush anything in his site. Eventually, people began to take notice and very interested in this “monster” they’ve never seen before. Everett Jasmer, like Chandler, enjoyed working with cars and making them with a different purpose. The two met and fate took over. Chandler, a Ford-Guy, and Jasmer, a Chevy-Guy, began collaborating and moving their trucks around the country for pure entertainment. The two began circling around the country, riding through muddy fields for bystanders and racing one another. Pretty soon, it became a new sport people were talking about. Monster Trucks took over as an extreme sports and so began the phenomenon of an entire event of racing, jumping cards, doing tricks, and smashing anything and everything. As the sport became more popular, it also became regulated, as all sports are. The tires must be 66 inches high and 43 inches wide. Each tire for every car is customized for that specific vehicle to set in place. It’s vital that the massive wheels, don’t take up too much wait. The more weight a car has, the harder it is to produce tricks and stunts for these trucks. It’s best trucks however, reduce the weight as much as possible and jump higher and better than the rest. With tires already averaging over $10,000 for a set of four, the truck itself total around $150,000. Luckily for fans, Monster Jam tickets are at a great price for all customers! 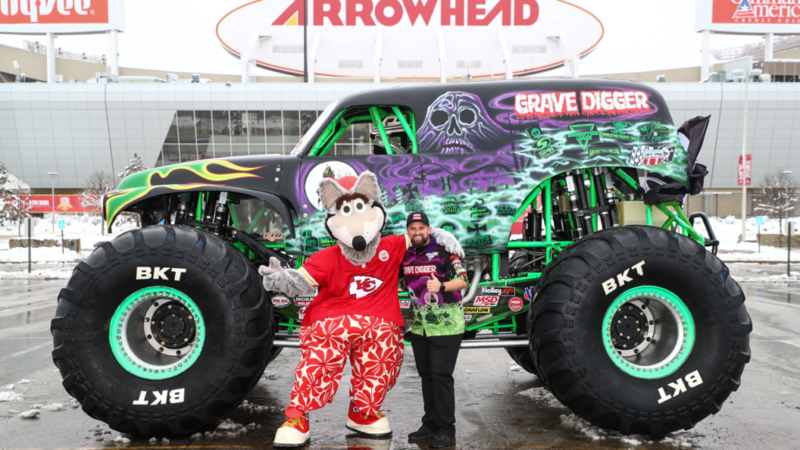 Arrowhead is going to be EPIC when it comes to hosting Monster Jam! Just make sure you plan ahead for all to come once you purchase your Monster Jam tickets. As we’ve learned Monster Trucks are massive, and that means massive engines too. The noises are going to rattle you to your core, just make sure you bring earplugs or earmuffs. Little ones will love the family-friendly event too, just protect their ears from the powerful noises within the stadium! It’s going to be hot! Kansas City summers never seem to give us a break from the heat so make sure you come prepared for the hot weather. Monster Jam begins at 7:00pm on Saturday June 15th. The entire show should last around two hours, with a brief intermission. Arrowhead will have their concession stands running for food and drinks. Just like football games, you will have to go through security upon entering the stadium.